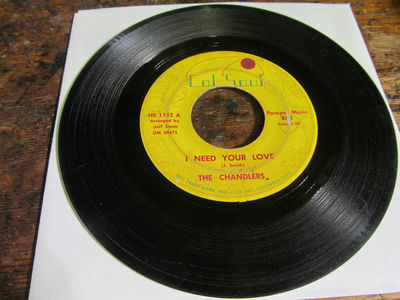 CHANDLERS I Need Your Love / Your Love Leaves Me Lonely 45 COLSOUL 1152 northern soul VG- plays OK RARE. vinyl has wear. It plays OK with light surface noise throughout. No skips. Playable, but has surface noise. Not the same copy that we sold last week. Important note: For high value orders at $100 or more, we require trackable shipping. This has little impact on domestic US shipments as our shipping fees reflect this service. However, this means that international orders must go via USPS Express Mail. This is the only trackable and insurable service we use. Note that USPS First Class or Priority Mail is not trackable. USPS Express Mail is expensive with a typical ballpark fee for one album being approximately $50. Note that the final shipping amount is based on weight and distance for our international customers. Please plan accordingly if you are an international bidder. M : Mint, a brand new record. VG+ : A used, reasonable copy. There will be obvious signs of wear and the possibility of light surface noise between tracks or during quiet passages, but still quite nice. VG : Very Good - a used played copy. There will be obvious signs of wear and likely light to moderate surface noise between tracks or during quiet passages. VG- : Very Good Minus - significant wear and marks and usually quite noticeable surface noise. G+ : In the record grading world, "Good" is not good. From here on down (Fair, Poor), we're talking about beat-up records only guaranteed not to skip. OUTSIDE THE USA? IMPORTANT PLEASE READ! Parcels weighing more than 4 lbs (5+ single 12" records or more) exceed "First Class International" weight limits and can only be shipped "Priority International". COMBINED SHIPPING RATES: All shipping rates are weight based, and so the more you buy and combine in one shipment the less your shipping costs per item will be. All 7" & LPs are shipped in protective custom-made corrugated cardboard mailers. Records are removed from their jackets to protect against seam damage,kept in sleeves and placed in 4ML plastic outer bags.